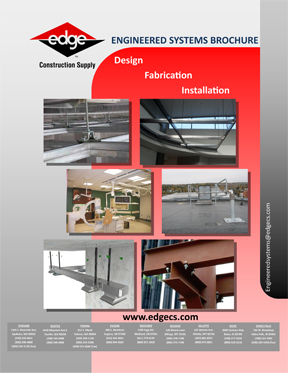 Edge Engineered Systems department has over 25 years experience in providing solutions for Unistrut framing systems, permanent fall protection systems, seismic bracing, equipment vibration isolation, Lindapter connections, aluminum railing, and other designed systems. Give us a call - We will provide you with a Quote! Edge has the ability to custom-design solutions to meet your unique specifications. We are flexible and easy to work with. We can provide full "Turn-Key" engineered solutions or custom material quotes and everything in between. Unistrut Solutions - Find All Unistrut Products Here! Edge has provided turn-key Unistrut engineered solutions for years. We pride ourselves in both a vast technical knowledge and inventory of Unistrut products. We can provide material take-offs, drawings, engineering, and installation for all your Unistrut structural framing needs. Whether you need help in designing a Unistrut frame for an x-ray system, equipment support, acoustical ceiling, tool festoon system, or architectural features; we can help (different finishes and materials available). In addition to designing, we frequently will cut and assemble Unistrut systems for customer. Contact Edge today for details at 509-535-9841 or Engineeredsystems@edgecs.com. Lindapter - Visit our Lindapter Page to Find out More! For more than 75 years, the Lindapter product has earned a respected reputation as the inventor and pioneer of steel connection systems, providing an independently approved and exclusive product range of steel connections, hollow section (HSS) connections, concrete decking connections, pipe/conduit supports and steel floor connections. Edge Construction Supply is proud to be the sole distributor in the Northwest servicing WA, OR, ID, MT & WY. The Lindapter brand embodies a unique concept creating fundamental advantages over traditional welding or drilling, including the significant reduction in installation time and associated labor costs, on-site adjustability, and the preservation of steel integrity and protective coatings. Whether joining primary structural sections, securing secondary beams or suspending building services, Lindapter has a proven, accredited solution. Edge can provide a permanent fall protection solution for your new building, existing facility, manufacturing plant, or any structure. Permanent fall protection systems are designed to last for years & work for specific applications. Edge sells a large amount of off-the-shelf product such as harnesses, soft goods, anchor points & "Buckets of safety". However, fall protection is more than just products, it is what you do to eliminate fall hazards, to prevent falls, and to ensure that workers who fall don’t get hurt. 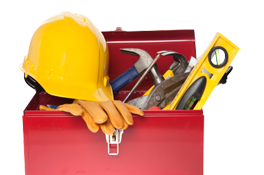 We at Edge Construction Supply are trained and prepared to guide you and your workers in coming up with a permanent solution to ensure you have a safe working environment. Additionally, we can provide annual inspections for several products. Seismic Bracing is defined as: Engineering Reinforcement added to a structure to prevent collapse or deformation of building elements as a result of earthquakes.These brutal forces exerted on buildings cannot be stopped - they can, however be dealt with in a manner that reduces danger and keeps damage to a minimum. Seismic bracing reacts to these unwanted forces and keeps buildings and their services stable and safe. Seismic bracing is more than just putting up wire & strut at 45 degree angles to make your duct, pipe and conduit appear braced. Many projects, specifications, building owners, & local construction authorities require engineering & structural analysis to be performed on this bracing. Edge can help you by providing a true system with engineerings & layout drawings. If you have your own engineering & simply need materials supplied, we can help with that as well. Contact us and let us help with all your Seismic Bracing needs. Contact our Engineered Systems specialist today at 509-535-9841.